Joelle Dietrick and Owen Mundy. Grid, Sequence Me. 2013. Installation of generative animations. Dimensions variable. Flashpoint Gallery, Washington D.C. Photo by Brandon Webster. Packet Switching is an ongoing body of work by Joelle Dietrick and Owen Mundy that visualizes architecture as fragments affected by economic and communications systems. The title of the series references how digital communiction breaks files into smaller manageable blocks of data called packets. Each packet is then sent through a network, taking the quickest route possible, and reassembled once they reach their destination. One JPG image, for example, might be broken into several packets, each of which may travel a different path through the net, even through different cities, before being recompiled into a copy of the original file. Detail: Joelle Dietrick and Owen Mundy. Grid, Sequence Me. 2013. Installation of generative animations. Dimensions variable. Flashpoint Gallery, Washington D.C.
To reference this common process used in networked systems, we wrote custom software to deconstruct a 3D model’s source code and produce unique fragments. 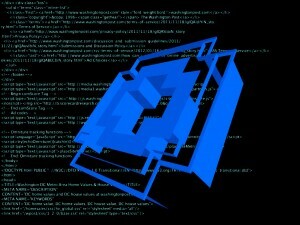 We remixed these fragments using an original application created in Processing. The resulting images become limited edition prints, large photo installations, wall-sized paintings, and animations. Our process underscores how incidental fragmentation and automation can streamline markets, but also make them vulnerable to systems failure. The use of architecture specifically points to recent real estate market volatility and considers how communication technology-enabled pursuits of profit margins alters our most basic needs. Joelle Dietrick’s paintings, drawings, and animations explore contemporary nesting instincts and their manipulation by global economic systems. Her recent artworks and research considers housing trends that complicate relationships to place. Her work has been shown at Transitio_MX in Mexico City, TINA B Festival in Prague and Venice, Museum of Contemporary Art (MCA) Chicago, MCA San Diego, Long March Space Beijing, ARC Gallery Chicago, Soho20 New York, MPG Contemporary Boston, Temporary Home in Kassel during Documenta (13), Flashpoint Gallery in Washington DC and as a permanent public art work at the University of Florida. She has attended residencies at the Künstlerhaus Salzburg, Anderson Ranch, Banf, and the School of the Visual Arts and received fellowships from the University of California, Florida State University and the Deutscher Akademischer Austausch Dienst (DAAD). 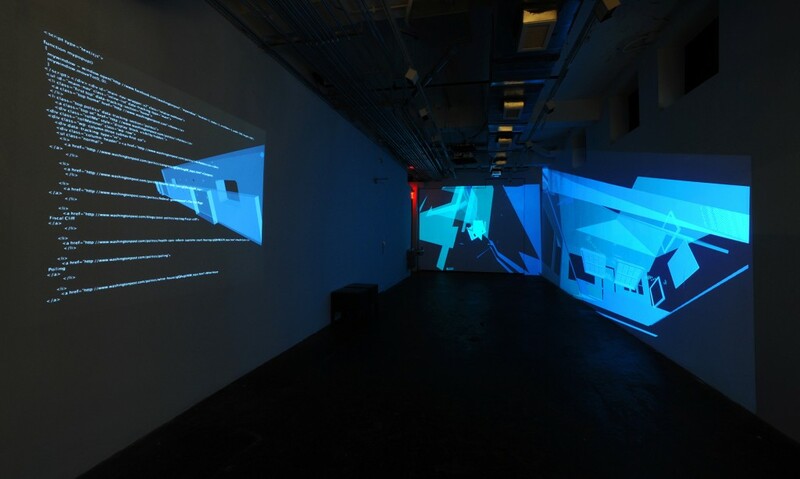 Owen Mundy is an artist, designer, and programmer who investigates public space and its relationship to data. His artwork highlights inconspicuous trends and ofers tools to make hackers out of everyday users. In 2009 he created Give Me My Data a Facebook application that helps users reclaim their information in various reusable data formats. His work has been shown at Transitio_MX in Mexico City, the California Center for the Arts in Escondido, CA, Compactspace in Los Angeles, Golden Thread Gallery in Belfast, the Sarai Media Lab in New Dehli, Bauer&Ewald Gallery and G.A.S. Station in Berlin, and APEXART, Flux Factory, and Art Currents Gallery, in New York. He is the recipient of fellowships from the states of Indiana and Florida, a San Diego Fellowship, and a DAAD Fellowship.